Happy holidays! 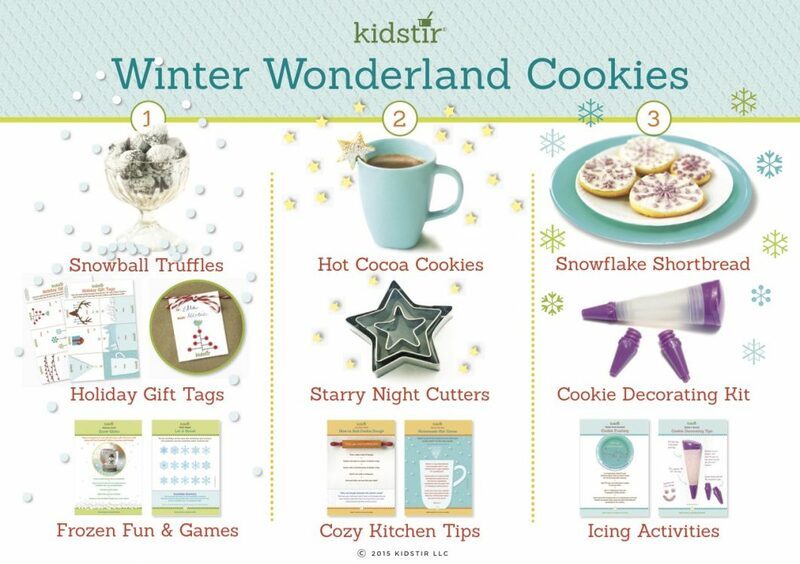 I’m so excited to introduce our December Kids Winter Wonderland Cookies Kit! It’s Christmas time and sleigh bells are ringing! This month’s kit has so much value in it- the recipes, the tools, the goodies- you and your little chef are going to be dazzled! Planning to give this kit as a Christmas gift to your kids? Here is a seasonally themed gift note to go with your box. As you know our 12 month prepaid subscriptions come with a bonus cookbook binder at no additional cost! Your little chefs can use this cookbook binder to organize their recipes for the whole year. Also make sure to print out Kitchen Rules, Table of Contents, and All About Me pages to add to their cookbooks. As this kit is themed around cookies, you must kick off by reading our post about Cookie Baking with Kids. Then, go ahead and ready, set, bake! Snowball Truffles So fancy looking, and yet so simple to make. I love this recipe – not only are these chocolate truffles delicious, they make the perfect gift. Bake a batch of these with your kids, decorate them with sprinkles, sugar, nuts, peppermint (mmm…crushed candy canes! ), whatever you want or have in the pantry. Then put each in a little baggie and attach our adorable Gift Tags that come in your kit. Really on a roll and need more Gift Tags? Print extras here! Hot Cocoa Cookies Gorgeous gorgeous gorgeous. And such a perfect match to hot cocoa (don’t miss the amazing homemade recipe inside the kit). These cookies can be made by the dozens and are so tasty, and also just so darn pretty. Kids will love cutting out the star shapes and you will smile every time you pop one in your mouth. I love how they’re not too sweet, just perfectly right! If you’re a hot cocoa fanatic like me, you will also love this Hot Cocoa Stirrers recipe. So insta-chic! Snowflake Shortbread If you’re going for decadence, you got it with this shortbread recipe. I might suggest this cookie be the one your kids submit to your holiday cookie exchange too! For those avoiding white sugar, this recipe uses maple syrup instead, giving it a unique and memorable flavor profile. Big, bold, with lots of surface area for little chefs to get creative with decorating and design. You are going to see your junior pastry artists shine with this recipe! We have made snowflakes, trees, letters, stars, moons, Santa, gift boxes, and even lots of funny faces 🙂 p.s. Here’s a fun little video that will teach your little chefs how to measure their liquid and dry ingredients for this baking project. Cookie Decorating Kit When I said the Winter Wonderland Cookies kit was packed with value, this is what I was talking about. A silicone pastry bag, durable, easy to clean, reusable and eco-friendly, with 3 awesome pastry tips. You can keep it easy or let your inner pastry chef out and get extremely detailed and creative with this tool. I use mine all year around for decorating cookies, cupcakes, and cakes. It’s a keeper the kids will love! Holiday Gift Tags In each kit you’ll find a set of beautifully designed gift tags printed on heavy stock card paper. You can use them for anything- toys, ornaments, and certainly the delicious food and cookie gifts you whip up with your Kidstir subscriptions. Give cookie gifts to your kids friends, teachers, relatives, neighbors. And don’t forget all those extra-curricular teachers and your kids coaches: karate, piano, ballet, whatever your little ones are doing these days. Starry Night Cutters How cute are these nesting star cutters? Three different sizes to warm up your chilly holiday evenings with cozy starry dreams. And, don’t forget that after you use them to make adorable star shaped treats this holiday season (you MUST check out these spectacular Homemade Marshmallow Stars), you can use them all year long for lots else. Cut cheese, fruit, bread and other foods into star shapes to delight your kids during snack or lunch time. Or, make more star cookies during 4th of July or a birthday celebration themed around space! 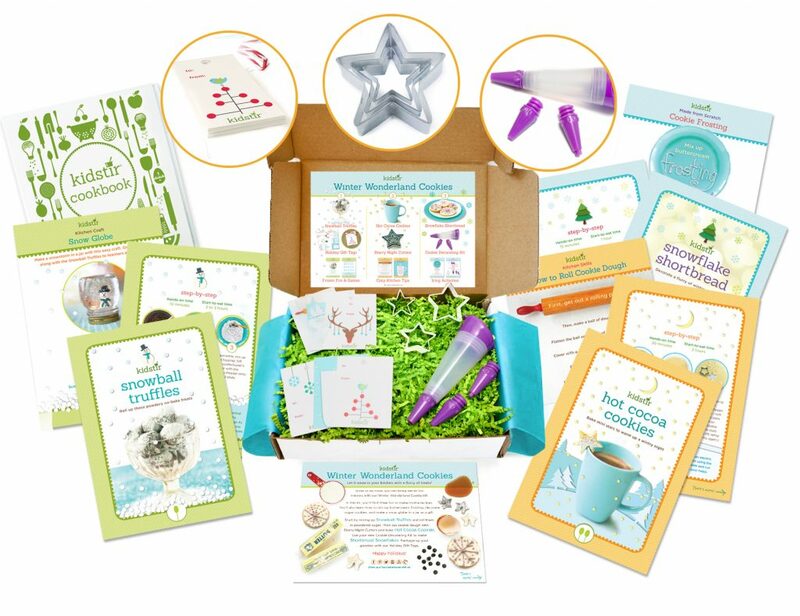 So far we’ve just discussed the recipes and tools in the kids cooking kit –don’t forget all the great foodie learning tucked into the kit: How to Roll Cookie Dough, Homemade Hot Cocoa, Made from Scratch Buttercream Frosting, Cookie Decorating Tips, Snow Globe Kitchen Craft, and a Let it Snow! Math Magic Puzzle. Mmmm…And then there are all the additional recipes and activities you can find on our DIY page. These Jolly Snowmen are so cute and will absolutely delight your kids at the kitchen table. Another fun and easy idea that you can use to decorate your home in holiday style: Sweet Trees! Merry Christmas Kids! Happy Holidays!